By delving into the interactions between a hydrogen molecule and muonic hydrogen, the heaviest hydrogen isotope to date, a team of researchers from academia and Pacific Northwest National Laboratory created a popular paper. 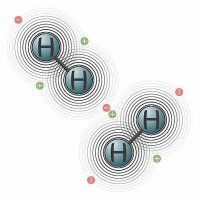 The article describes the kinetic isotope effects for muonic hydrogen and deuterium, which differ in mass by a factor of 36. The article was one of the 20 most accessed articles in the November 2011 on The Journal of Chemical Physics. The article's popularity, in part, is because it provides a more detailed account of work published in the prestigious journal, Science. "It's amazing to me that such a simple reaction can continue to surprise and fascinate us," said Dr. Bruce Garrett, a co-author on this popular paper and the director of PNNL"s Chemical & Materials Sciences Division. Acknowledgments: Natural Sciences and Engineering Research Council of Canada, DOE Basic Energy Sciences, Chemical Sciences, Geosciences, and Biosciences Division, and Air Force Office of Scientific Research funded this research. Reference: Fleming, DJ, DJ Arseneau, O Sukhorukov, JH Brewer, SL Mielke, DG Truhlar, GC Schatz, BC Garrett, and KA Peterson. 2011. "Kinetics of the Reaction of the Heaviest Hydrogen Atom with H2, the 4Heμ + H2 → 4HeμH + H Reaction: Experiments, Accurate Quantal Calculations, and Variational Transition State Theory, Including KinetQc Isotope Effects for a Factor of 36.1 in Isotopic Mass. "The Journal of Chemical Physics 135(18):184310-184327. DOI:10.1063/1.3657440.